This article is the first of a series of pieces that will be published this year to celebrate the discoveries made during the first comprehensive survey of the Frederick C. Packard, Jr., Collection of recorded sound, which is housed and preserved at the Woodberry Poetry Room, Harvard University. On October 19th, 1938, a year and a half after the Columbia Workshop debut of his first (and what is largely considered the first) verse play for radio, The Fall of the City, Archibald MacLeish sat down at a microphone in Holden Chapel at Harvard University to record (and more importantly to inform the reading of) his most ambitious verse drama to date: Air Raid. With that perhaps dubious distinction, the poet begins to read. In keeping with his first radio play, Air Raid would be short and un-obscure. 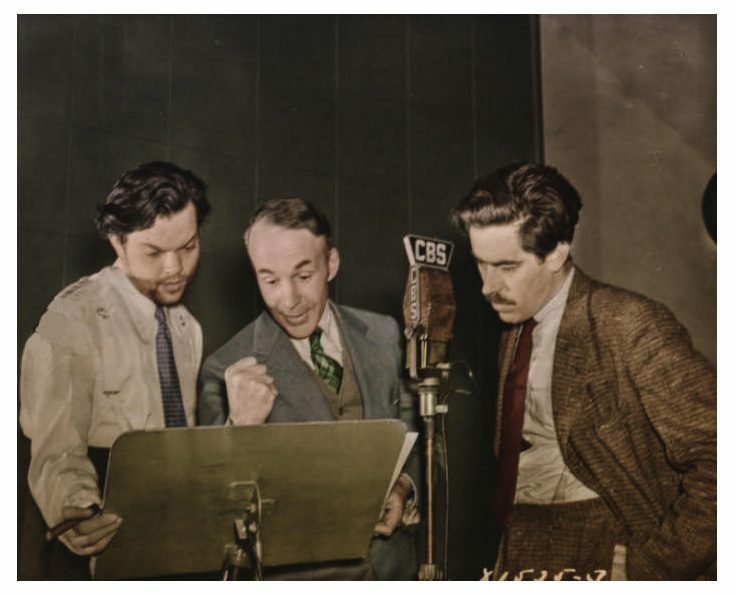 Likewise, the new play would be narrated by a baby-faced Orson Welles. But the most overt similarity between the two works would lie in their unambiguously political tenor. In “The Fall of the City,” a town terrorized by its own fear collapses under the threat of an invented enemy. 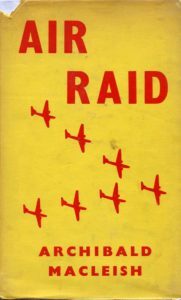 Air Raid would also play into world war anxiety by sketching the military theatre’s invasion of the domestic one. It was this desire to connect with the broader play that initially drove MacLeish toward radio. Broadcast could give his poems public dimension in a way that pages never would. In his foreword to The Fall of the City, MacLeish writes that radio’s audience was “infinitely greater” than poetry’s, which “alone should deeply move the American poet whose present tragedy is his isolation from any audience vigorous enough to demand his strongest work.”. Not only would broadcasts reach listeners in the millions, but the very narrative conventions of radio introduced a new set of tools perfect for dismantling the fourth wall. MacLeish had always envied the Greek chorus — that “most useful dramatic personage” — for its ability to unobtrusively address the audience and direct the narrative. The chorus functioned as a witness: at once in the story and outside of it, they served as a go-between for audience and actor. They brought the story public. But the chorus’ usefulness was limited: there was a “rather ridiculous self-consciousness involved in carting a chorus in and standing them against the wall and having them recite.”  Radio, by introduction of two new dramatis personae — the field reporter and the studio announcer — allowed for this same kind of direct address. But while the chorus stood out in the world of the play, these two types moved imperceptibly inside it, native to the paraphernalia of radio itself. But what perhaps distinguishes the play from trite and gendered moralizing is how MacLeish employs radio within the familiar parable. If the human characters exist only as timeless symbols, the radio announcer is the clock which anchors them. The play opens to the studio announcer’s voice: “When you hear the gong sound…/ The time will be … / Ten seconds past two A.M. precisely…” And as the tension heats up, it is the announcer who reminds the listener of the looming threat: “It’s two hours now since dawn. / They could make it in two: they could make it under — / One and a half from the fields to the border: / Ten minutes more.” The women and officers speak in generalizations: it’s the announcer who tells the listener about what’s happening in the present moment, or as he often puts it: now. It’s worth noting that even in the 1930’s, the idea of a synchronous ‘now’ was still new. Before time zones were implemented in 1883, leaving your city often meant leaving your time: every county had its own clock. This was no issue when, for the most part, people stayed put. But, the continental railroad made time coordination necessary and so the clocks slowly standardized. In the fallout of World War I, as MacLeish was writing Air Raid, people were still wrapping their heads around what the word “now” meant on a global scale. The struggle to imagine a global “now” underlies the women’s refusal to accept imminent danger. Women, in MacLeish’s narrow world view, represent as provincial a demographic as any — never looking outside their own yard. They think they recognize war: “We have seen such people in this place before,” one says, “They come in uniforms carrying elegant banners. / They march up and down. They ruin roads.” In other words, they’re used to enemies they can see, ones that exist in their immediate surroundings (and immediate time frame) — not one who comes from any distance, at any time. But, like the approaching danger, the radio is not grounded. The announcer has the nearly omniscient foresight the human characters lack. As the announcer says in his opening monologue, the radio can tell you “what is happening in France / Or China or in Spain or some such country.” He often repeats “Stand by: we’ll try to take you through,” and that’s precisely what the radio does. While the women are wounded by their short sightedness, the radio offers the possibility of a path through the chaos of competing places, times and stories toward order. Put simply, the radio works as timekeeper. It offers a single testimony, a now. It this idea of the radio as the world’s metronome that gives these short poetic test recordings their intrigue. He recorded them, after all, so people could hear the specific rhythm with which the announcer should read. As one listens to the tape, his concern for cadence is clear. The sounds swell and recede with hypnotic consistency: “Ladies and gentlemen, you have only one thought tonight,” he reads. Demott, Benjamin. “The Art of Poetry No. 18.” The Paris Review. Summer, 1974. Issue no. 58. MacLeish, Archibald. The Fall of the City. New York: Farrar & Rinehart, Inc., 1937. Pg. xiii. Porter, Jeffrey Lyn. 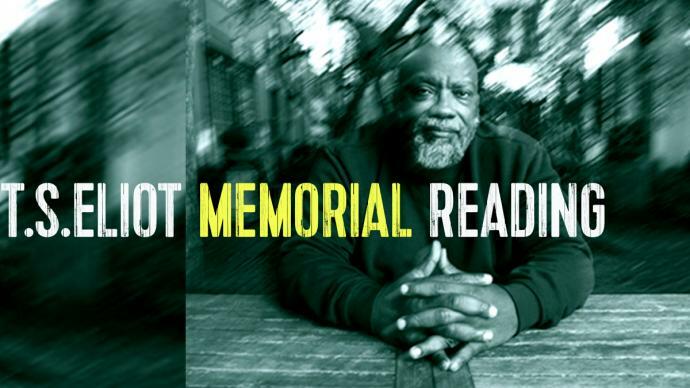 Lost Sound: The Forgotten Art of Radio Storytelling. Chapel Hill: UNC, 2016. Print. Pg. 53. MacLeish, Archibald, Bernard A. Drawback and Helen E. Ellis. Archibald MacLeish: Reflections. Amherst: U of Massachusetts, 1986. Print. Pg. 119. It’s worth nothing that the play is subtitled A Play for Women and strikes this current listener as regrettably dated and limited by its patronizing tone. Righting the sexisms of the early 20th century is, however, beyond the scope of this post. I’d wager what MacLeish’s critics found grating in his work weren’t his ‘politics’ per se, but the simple, pat symbolism he used to convey them. Air Raid is no exception in this respect. Tarpley Hitt is the 2016-2017 Undergraduate Fellow at the Woodberry Poetry Room and a junior in Lowell House. She studies Comparative Literature, makes the costumes for the Hasty Pudding Theatricals, and periodically hosts an evening radio show on WHRB 95.3FM.